When I called on Generalissimo Stalin yesterday evening I said I wanted to ask him for a site on which to build a new British Embassy, offices and living accommodation for the staff. This indicated, I said, that we wished to remain permanently represented in Russia. Generalissimo Stalin said that he thought it would be possible to meet me. Five sites were offered for inspection over the following months but none was attractive enough to pursue. The ambassador was anyway recommending against building anew because the need for more office space was lessening, any new building would inevitably be poorly built, and the exchange rate was unfavourable. The hope was that the embassy could renew its lease on the Charitonenko house when the present term expired in June 1952. On Christmas eve 1952, however, the embassy was told to leave within three months, surmising the reason to be that it caused offence by being so close to the Kremlin. Three premises were offered as alternatives but all were unsuitable. Lord Talbot de Malahide, a serving diplomat in the Foreign Office, was tasked in 1953 with finding a satisfactory way forward. He discovered that the Russians were again pursuing their town planning re-arrangement for the island. The Foreign Office and the Office of Works came close to acceding to a move but the foreign secretary, Sir Anthony Eden, made his ‘greatest possible reluctance’ about doing so known to his Russian opposite number, who agreed to look again at the Russian plans. The result was a new five-year lease on the Charitonenko house which, with a five-year renewal, bought the embassy security of tenure until 1963. In 1964, the question of new sites for the British embassy in Moscow became reciprocally linked with the Russians’ requirement for new sites in London. The first proposition, rejected by both sides, was the exchange of St George’s, Hanover Square, burial ground in London for a site on the edge of Moscow in the Lenin Hills. It transpired that the Ministry of Public Building and Works had no powers to acquire land on behalf of the Russians. The most practicable way forward was found to be for the Crown Estate Commissioners (CEC) to hold the land and grant a long lease to the Russians. In 1965, the Russians were offered and accepted the site of 1.05 hectares at Nos.1-7 Kensington Palace Gardens (KPG) in London and in the following year the British were offered and accepted in Moscow, subject to a few boundary extensions, a site at No.10 Smolenskaya Embankment of 0.92 hectares, on the river almost opposite the Ukrainia hotel. 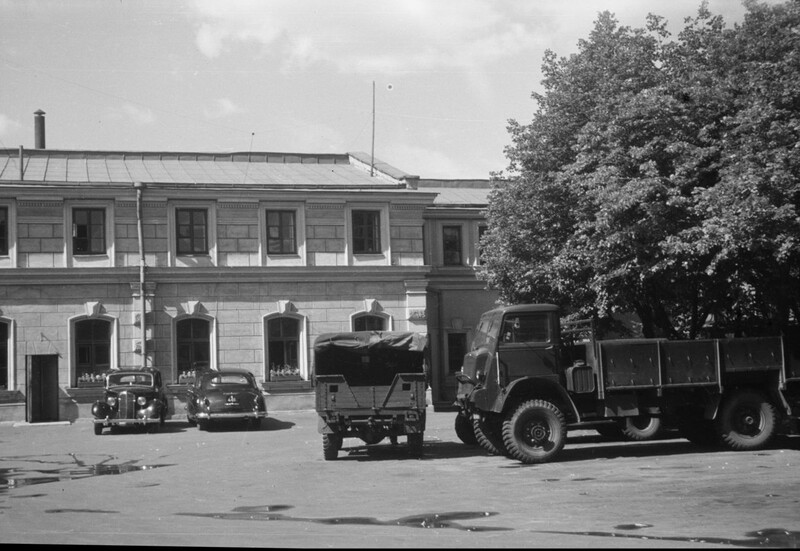 The basis for a reciprocal deal evolved during the later 1960s to include second sites in each capital: at Kensington Barracks and on Vakhtangova Street. 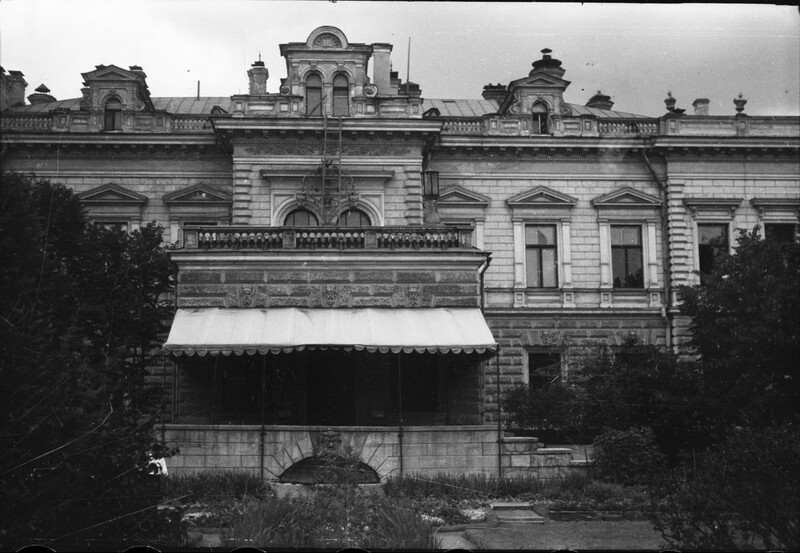 The Russians increased the pressure after 1969 by restricting subsequent leases of the Charitonenko mansion to five years, then three, and finally to annual leases. In 1971, the CEC took over the Kensington Barracks site in readiness for leasing to the Russians, and the building at the western end of the 1-7 KPG site (and the only one actually to give on to KPG), No. 6/7, was listed for protection against its demolition. Jockeying for sites and negotiating advantage continued, with the Russians preferring to hang on to the large house at No.13 KPG and the British to No. 14 Morisa Toreza. Both sides undertook early design work for their intended sites. The Russians were told in 1976 that their outline proposals for London, which included demolition of No. 6/7 KPG, and the enclosure of the Barracks site behind high and bleak perimeter walls, were unlikely to prove acceptable and an architectural firm called Mayell Hart was commissioned to help the Russians pay greater respect to British planning sentiments. Their success in doing so was limited. By 1978, local opposition to the Russian proposals became overwhelming and the British government withdrew the Barracks site. In Moscow, it announced that it planned to build new offices and UK staff flats at the Smolenkaya site, stated its intention to retain the residence at Morisa Toreza, and offered to return the Vakhtangova site. This bid for Morisa Toreza was firmly rejected. By then, a former Territorial Army site at 245 Warwick Road had been identified as a possible replacement for the Barracks site but was not to be offered to the Russians until they had proposed a suitable alternative site for a new residence in Moscow. The Russian invasion of Afghanistan at the end of 1979 prompted a two year hiatus in negotiations. In 1981, the Russians offered a site for a new British residence on Voyevodina Street, of 0.46 hectares, close to Spasopeskovskaya Square (where the US had its residence), and the British offered 245 Warwick Road, of 0.80 hectares, in return. 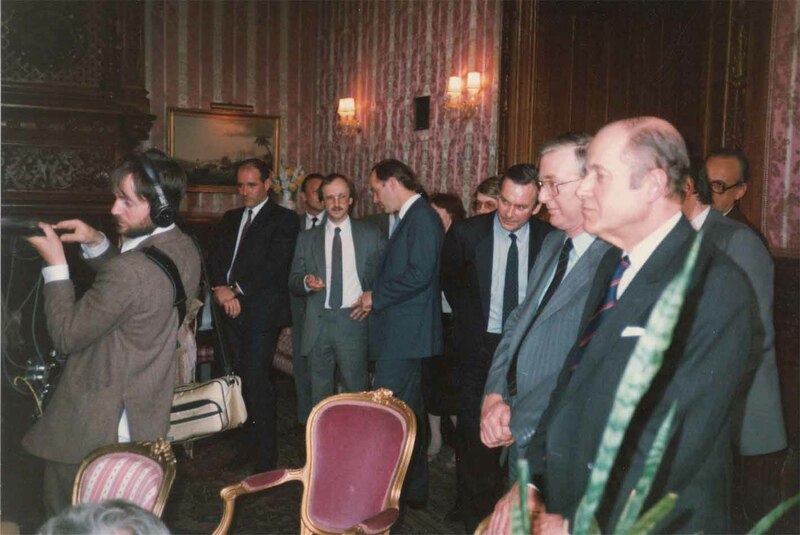 In 1982, shortly before responsibility for the overseas estate passed from the Property Services Agency to the FCO, the FCO decided to upgrade the negotiations, informed by the strong view of its Ministers that it should negotiate to keep Morisa Toreza if at all possible. Sir Curtis Keeble, a former Chief Clerk and recently ambassador to the USSR, was appointed the FCO’s chief negotiator for new embassies in Moscow and London. Keeble, not many months into his retirement from Moscow, was totally familiar with all the sites issues. Given that the Russian government controlled all property in Moscow and that their leases in London from the CEC were at the point of expiry, he was certain that a reciprocal inter-governmental deal was the only way forward. Given also the security difficulties that the Americans were experiencing in Moscow, strict reciprocity would require both concurrence of activity at every stage and construction of building shells by the host government for fitting out by the sending government. It was a significant help in London that Section 122 Paragraph 3 (c) of the recent Local Government, Planning and Land Act (1980) granted the Secretary of State power to acquire and dispose of land in the UK for a foreign sovereign Power: this greatly simplified the FCO’s dealings with the CEC. Negotiations duly started during 1983: they were just about the only bilateral contacts between the British and Soviet governments at that stage of the Cold War. Progress was slow, difficult and often tedious. Reciprocity required that each side needed to secure what it wanted in the other’s capital while making sure of being able to secure what it would have to provide in its own. Keeble and his team soon came to envisage three agreements: an umbrella Sites Exchange Agreement that would outline the arrangements for reciprocity and step-by-step concurrence in both cities, a Lease Agreement to control site terms, and a Building Agreement to control design and construction matters. Interim arrangements for the continued occupation of the current premises in each city were the first to be agreed. Exchanges of Notes in July 1985 and September 1987 consolidated these arrangements up to October 1990. The second site in each city was debated. In London, the Russian side wanted a better site than 245 Warwick Road and the FCO invested much time in visiting surplus health service sites across London in the hope of springing an acceptable site. It failed in this endeavour, and the FCO therefore acquired the site from the Ministry of Defence for £1.04m through an Interdepartmental Transfer on 16 March 1987. In Moscow, the British side had asked for confirmation that the five storey apartments building on the Voyevodina site, fronting Spaso Square, would be demolished. It was occupied apparently by retired generals and ballet dancers who might be hard to dislodge, but the Russian side promised to offer a cleared site: on that basis, the British side accepted it. To secure the main Russian site in London, 1-7 Kensington Palace Gardens, the FCO paid £8.25m in three instalments to the CEC for a 99 year lease, to replace the lien that had been in place since the 1960s. Besides the CEC, other bodies in London needed to be brought or kept onside. The planners of the Royal Borough of Kensington and Chelsea needed to be rather more flexible than they wished to ensure that the Soviets could build as much as they needed on the 1-7 Kensington Palace Gardens site. The Minister of State, Baroness Janet Young, was astute at lobbying the Planning Committee to the effect that the Soviets could build up to seven storeys, the same height as the aptly-named Embassy Hotel opposite. An understanding was also achieved with the Department of the Environment that the buildings at Nos. 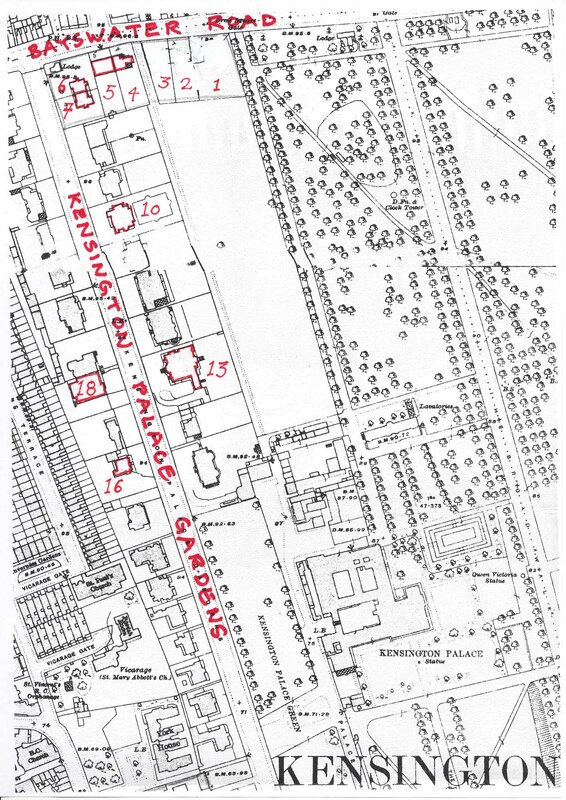 4/5 Kensington Palace Gardens were not listable, as otherwise the site on offer could not be called the cleared site that was required by the sort of reciprocal agreement that was emerging. Bill Jack, of Building Design Partnership, was commissioned by the FCO and the CEC to advise the Russians about planning and building matters in London. The Prince of Wales wished to be satisfied about what building might arise on 1-5 Kensington Palace Gardens (actually on Bayswater Road, at the far end of North Park, used as the Royal Household’s playing fields). The FCO took the precaution in 1986 of paying the Bailiff of the Royal Parks for the planting of some fast growing young trees to screen from view anything of a displeasing nature that might eventually go up on that site. The Prince also sought the advices of the Royal Fine Art Commission, who in consequence maintained a close interest. Finally, the Security Service were interested in what the Russians hoped to build in London, and the Treasury needed frequent updating. 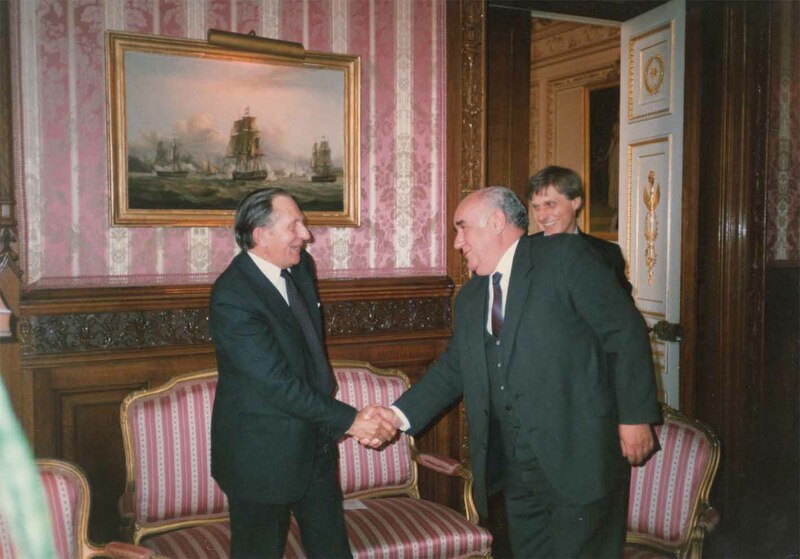 Nine rounds of stodgy negotiations culminated in the signature of a Sites Exchange Agreement (SEA) in Moscow on 31 March 1987 by Foreign Ministers Geoffrey Howe and Eduard Shevardnadze, presented to Parliament as Cm 207, Treaty Series No. 42 (1987). The SEA provided for the exchange of two sites in Moscow (Smolenskaya for offices and staff housing and Voyevodina for a residence) against two in London (1 – 7 KPG for offices and a residence and 245 Warwick Road for staff housing) once designs were agreed, planning permissions granted, Building and Lease Agreements entered into and construction completed in both cities. Conditionality was at the heart of the SEA: neither side could vacate its present buildings until the construction of new ones was completed in both cities. 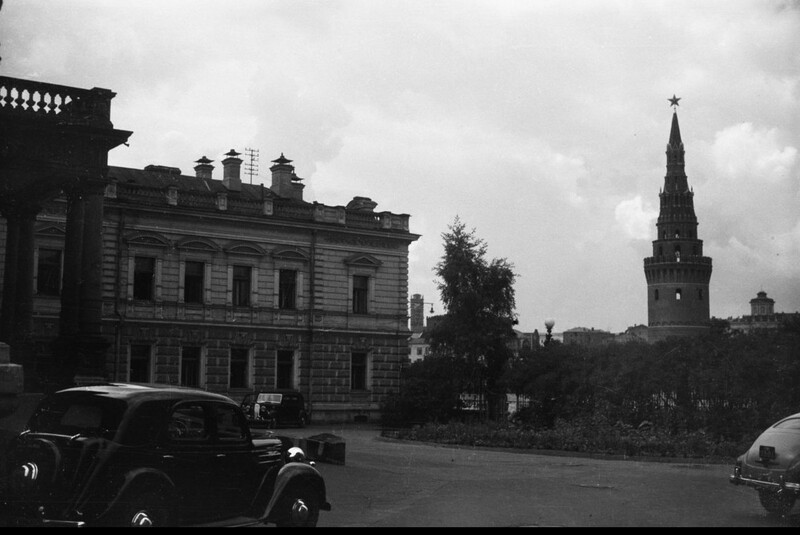 The FCO would then vacate the site and buildings at 14 Morisa Toreza and the Soviet Embassy would vacate the premises at Nos.10, 13, 16 and 18 KPG, which would be returned to their owners, the CEC. The SEA was in two parts: the first described the sites to be exchanged, explained the scopes of the future Building and Lease Agreements, and who should do what. The second part set out procedural considerations, and particularly actions necessary for obtaining planning permissions to build on all four sites. The second part came into effect upon signature, but the first part only after the actions specified in the second part had been completed. With the SEA signed, the main focus of the British side switched to developing the designs of the future British buildings in Moscow – new offices and flats, and a new residence. During Prime Minister Margaret Thatcher’s visit to Moscow in June 1990, she and President Mikhail Gorbachev agreed in principle that the UK could retain 14 Morisa Toreza for the British ambassador’s residence in Moscow, provided that the offices moved to the Smolenskaya site, and that the Soviet Union could retain 13 KPG as the Russian ambassador’s residence in London. The terms of this reciprocal deal were the subject of two Agreed Minutes in March 1991, followed by an Exchange of Notes signed in London on 22 November 1991, presented to Parliament as Cm 1930, Treaty Series No. 27 (1992). So as to balance the residence exchange (14 MT being considerably larger than 13 KPG), the FCO agreed at its own cost to refurbish 6/7 KPG, which the Russians were due to receive under the SEA and into which they moved some of their unclassified offices upon completion of the refurbishment works in 1996. The deal also enabled the FCO to relinquish its rights to the Voyevodina site, and the Exchange of Notes set out arrangements to govern continued Russian occupation of Nos.10, 16 and 18 KPG (which, in a side agreement with the CEC, the Russians exchanged for 15 KPG). To give effect to its side of the retention of residences deal, the FCO purchased from the CEC a 99-year lease on No.13 KPG for £23million. In consequence, three 99-year leases were signed in November 1993: the headlease of 13 KPG from the CEC to the FCO; the underlease of 13 KPG from the FCO to the Russian ambassador; and the lease of 14 Sofiskaya (so by then re-named) from the Russian MFA to the FCO. The aftermath of the Cold War and the demise of the Soviet Union brought other significant changes. The design brief for the Smolenskaya site was recast so as to be less formidable from security and financial points of view, and new designs evolved. The Russians were in worsening financial circumstances and unable to fund their own intended projects in London. They hatched a variety of ingenious schemes for cashing in the value of Nos.1 – 3 KPG to fund other development, but these all failed, mainly because of their unpreparedness to share with the CEC the development value arising from commercialising the site by removing its restriction to diplomatic use. The Agreed Records of meetings held in London in November 1993 and October 1995 contain the outlines of these aborted discussions. Throughout this process, however, it gradually became plain that the Russians would not continue to insist on strict timescale reciprocity in Moscow, provided that the FCO was reasonably helpful in assisting their estate rationalisation in London. In those circumstances, the Russian side was prepared to conclude negotiations about the Lease and Building Agreements foreseen by the SEA: both documents, signed in October 1996, were shorter and simpler than pre-thaw drafts. Although the prescribed actions remained broadly reciprocal in Moscow and London, two major requirements of the former arrangements were relaxed. The receiving country could now undertake all of its own building works in the host country, and each side could proceed at its own pace. The Lease Agreement, with four annexes, set out the forms of lease that would be required in due course for the Smolenskaya, 1-5 KPG and 245 Warwick Road sites. The Building Agreement, with two annexes about customs clearance and personnel, while remaining strictly reciprocal about rights and duties, no longer imposed any conditions about concurrence of activities. The two Agreements were presented to Parliament as Cm 3502 and 3503, Treaty Series Nos. 1 and 2 (1997). Also in October 1996, an Exchange of Notes was signed that tidied up a collection of loose ends. It confirmed, for example, that all prior references to the Government of the USSR shall be interpreted as referring to the Government of the Russian Federation. It provided for the relaxations in reciprocity and, most importantly, it brought Part I of the SEA into effect. 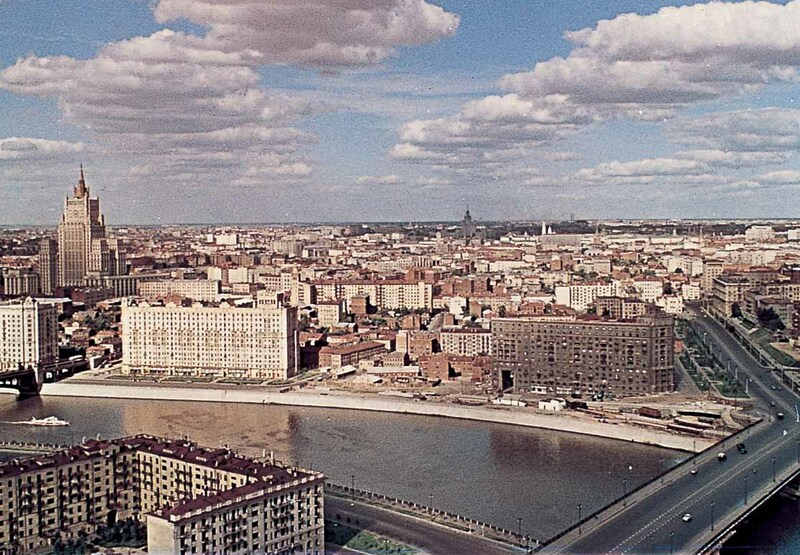 In the same month, the contract was let for the construction of the buildings on the Smolenskaya Embankment. October 1996 therefore effectively brought half a century of negotiations to a close. 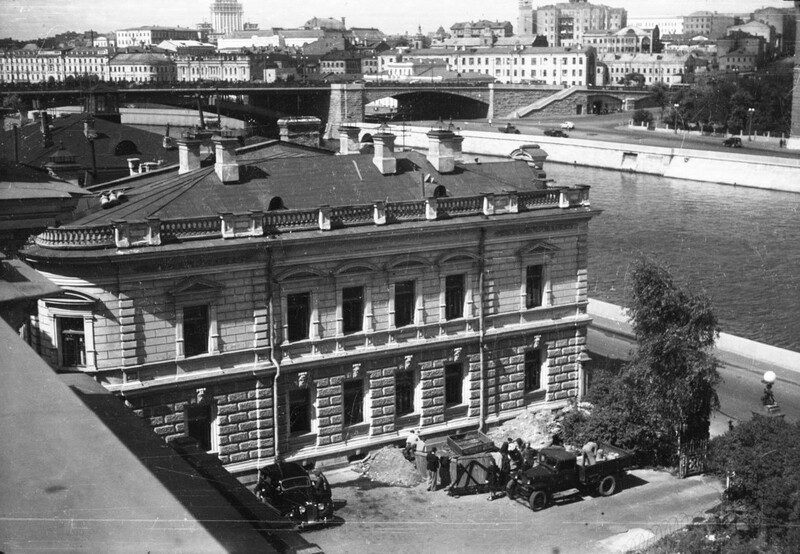 Building a new British embassy on the Smolenskaya Embankment, moving the offices away from the Sofiskaya Embankment, and retaining the Charitonenko Mansion as the British residence were all now achievable. 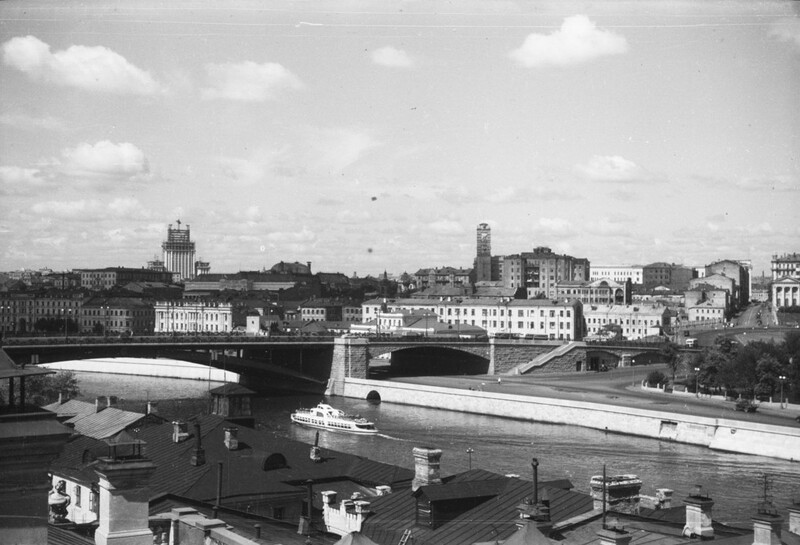 Looking north-west from the roof of the mansion, 1950. Looking down on west wing and front courtyard, 1950. East wing beyond porch to mansion, 1950. 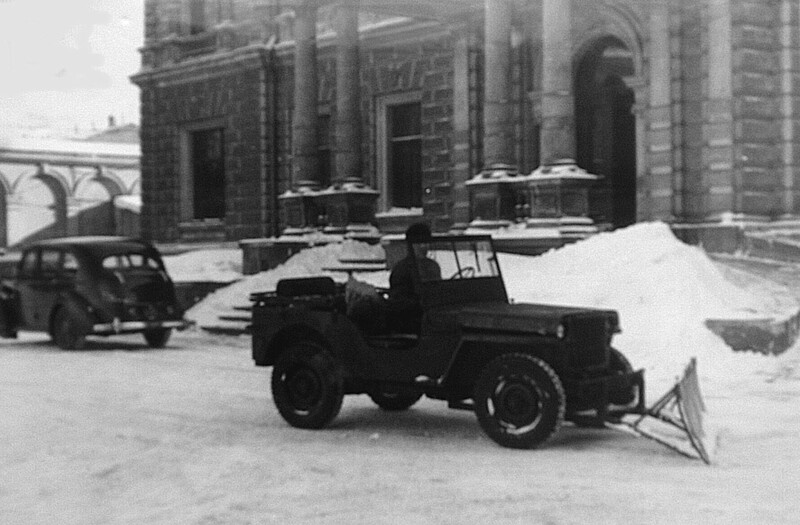 Snowplough in front of the mansion, 1950. 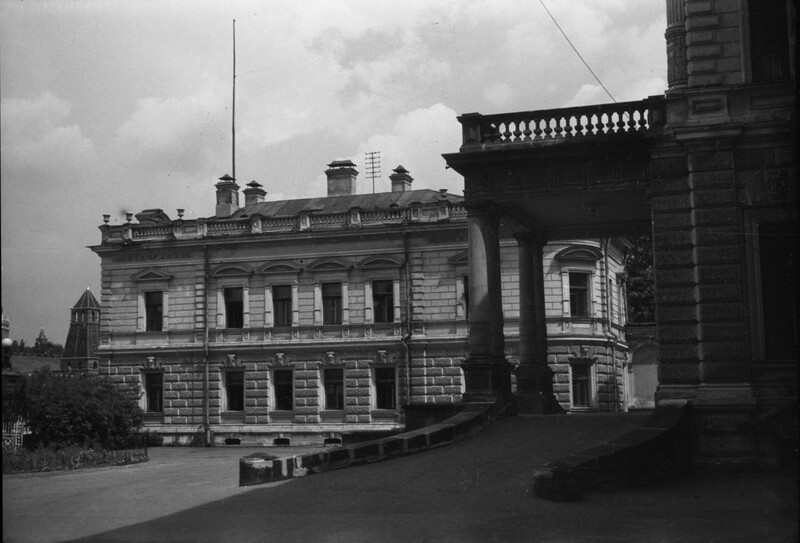 West wing, from south-east, 1950. Ambassador’s study, with steps to garden, 1950. Part of garden block, 1950. The site on Smolenskaya Embankment. Sir Curtis Keeble and ??? comparing drafts in the Red Room at the residence, with Jeremy Hill (legal adviser) and ??? keeping watch. Sir Curtis Keeble and ??? reaching agreement. 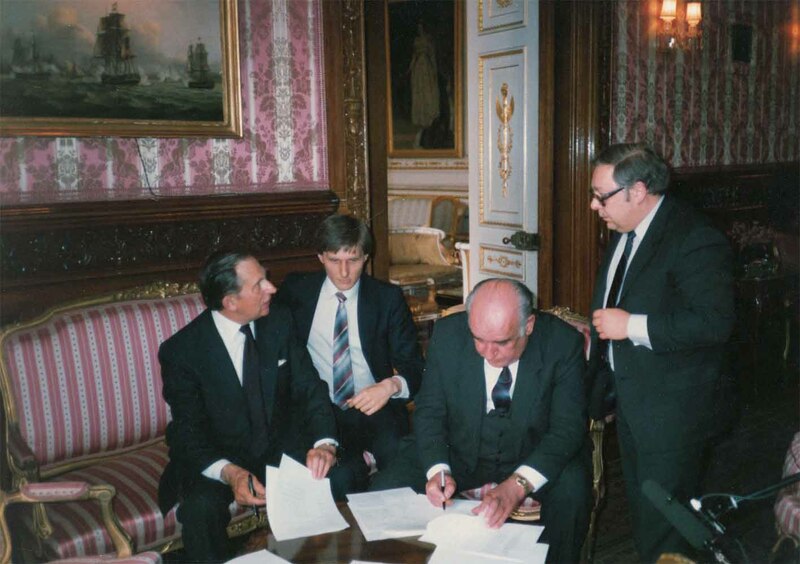 Watching a signing: Grigory Karasin (later Russian ambassador at London), Roger Nuttall, Richard Muir and Sir Bryan Cartledge, British ambassador. 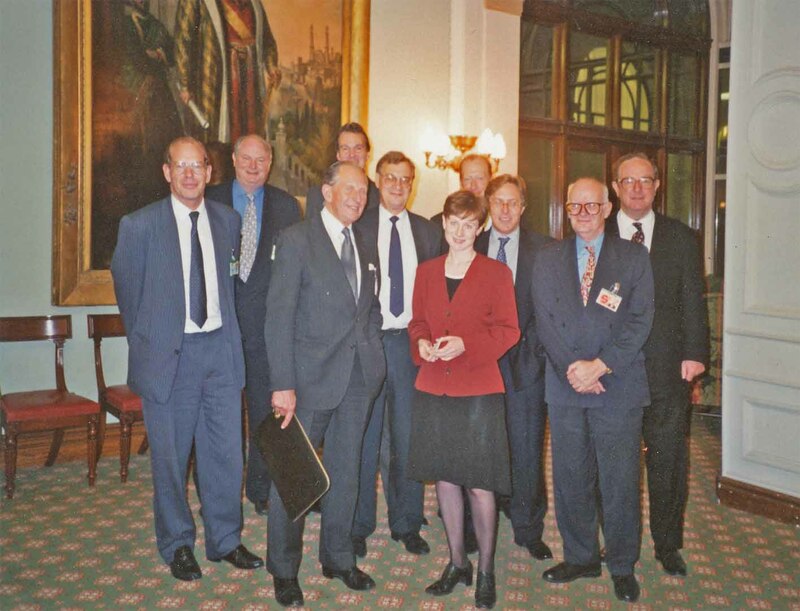 After the signature of the Building Agreement at the FCO in London, October 1996: Mark Bertram, Richard Burton, Sir Curtis Keeble, Chris Hartfield, ?? ?, Alice Burnett (legal adviser), ?? ?, ?? ?, Tony Melvin, Red Shaw. 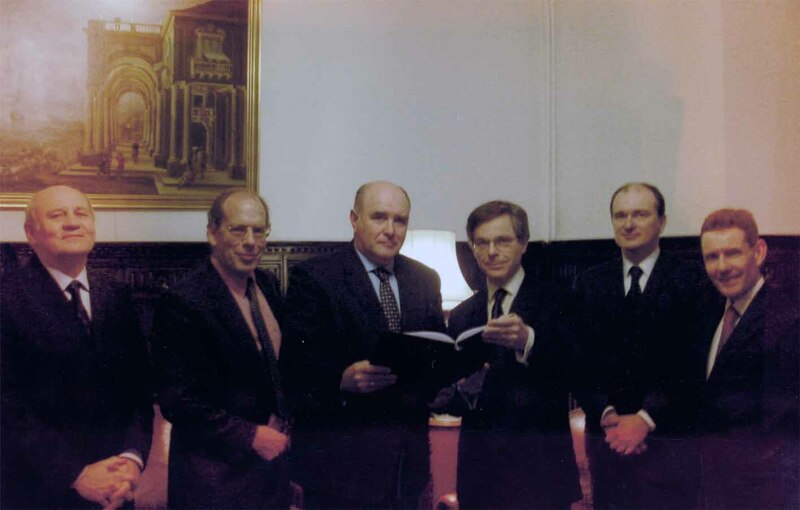 After the signature of the Warwick Road disposal agreement at the Russian embassy in London, December 2004: ?? ?, Mark Bertram, Grigory Karasin (Russian ambassador), Geoff Gillham, ?? ?, Jeremy Neate.